Much of my work over the last ten years has been based on the walks we do up into the mountains and glens. Indeed, many of the view points in my paintings can only be reached by walking up high and looking down. For some time now however, I’ve wanted to do some pieces based on the Scottish coast-line but in all honesty I’ve been fighting shy of it …not quite sure how to approach the subject. The trip over to Harris, in some ways, forced me into it. The weather was pretty bad much of the time and we didn’t venture too high. Instead, on several days, we explored the fabulous Harris coast-line with its amazing west coast beaches. 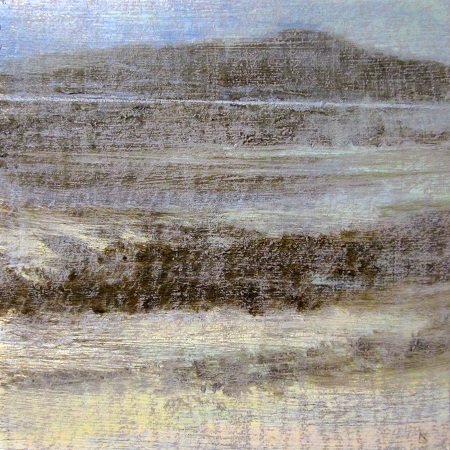 This small painting is based on one of the sandy inlets we stopped by on a rather damp afternoon. I can’t remember the name of the spot but it was wonderfully quiet and very beautiful. This painting is one of four new pieces I’ll be taking to ‘the gallery on the corner’ sometime in the next couple of weeks …..so if you live in Edinburgh or are visiting the city, why not pop along to see it. It will be at ‘the gallery on the corner’, 34 Northumberland St, Edinburgh from Tuesday 14th July. Details of this gallery can be found at the side of this page.